Big guys making little cupcakes isn’t something you see often. 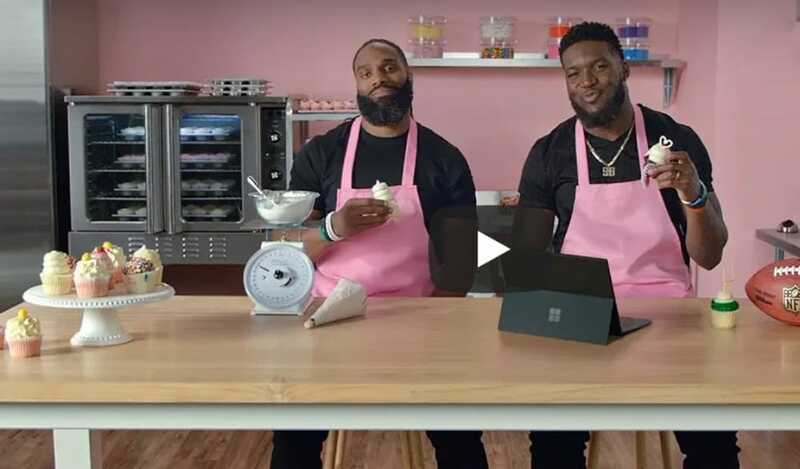 But two professional football players have teamed up to whip up the tasty treats as co-owners of a Gigi’s Cupcakes franchise in Bee Cave, Texas KVUE reports. While the career change seems a little unorthodox for former Tennessee Titans player Michael Griffin and current Titans linebacker Brian Orakpo it’s a pretty sweet matchup for the football players turned franchise owners who wanted to come up with a plan to support their life after playing in the league. The two players then linked up with Griffin’s childhood friend to round out their plan to purchase a franchise and launched Gigi’s Cupacakes in Bee Cave. “It’s just like when you play football, the repetitiveness allows you to come in a knock it out quickly,” said Griffin who enjoys serving up sweet treats like red velvet cupcakes. Griffin played for the Texas Longhorns while in college and recently retired from the Tennessee Titans. Orakpo is still on the team’s roster. But he’s also behind the counter tackling baked goods as the decorator. “He has a stance to sack the quarter back put he also has a stance to decorate the cupcakes,” said Griffin about her co-owner Orakpo who is a linebacker. The men said they have to learn everything about operating a cupcake business and things seemed to be booming so much so that they’ve now opened up a shop in Austin, Texas. Cupcake and football fans can also catch the budding bakers in a fun new commercial!